The company promoting Walking With Dinosaurs at the Air Canada Centre is sending me and one of my kids to opening night. 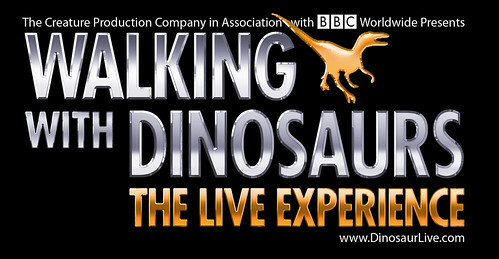 "Walking with Dinosaurs - The Live Experience" as it's billed is a live theatrical adaptation of the six-part television series produced by the BBC. I'm told 15 life-size mechanical dinosaurs will roam the ACC during this event and that sounds pretty damn cool. In exchange for the tickets, I promised to write about the event and share with you all this $5 discount. Walking With Dinosaurs runs from Wednesday, June 18 through Sunday, June 22. 2008.